Of course, since I’m a foodie, Thanksgiving is my absolute favorite holiday. I don’t live in the same city as my family and Thanksgiving is generally the one time of the year that my entire family gathers. So, I cherish it. I revel in being able to love on my family in a way that brings me the greatest joy – through good food! For others, however, Thanksgiving can be a little daunting, given the abundance of food ever present all day long. Rather than worrying, there’s a better way to navigate through Thanksgiving festivities, by focusing on two key nutrients. These nutrients are superfoods of the heart, and they are limitless in their nourishing potential. What better day to practice gratitude than on Thanksgiving! Gratitude is strongly and consistently associated with greater happiness, as well as better physical and mental health. In fact, a 2013 study showed that being grateful particularly as we age, leads to better physical health. Those who practiced gratitude were more likely to engage in health promoting behaviors, such as staying active, eating healthy, maintaining social support and visiting the doctor for regular checkups. Gratitude is a key component of mindful eating. 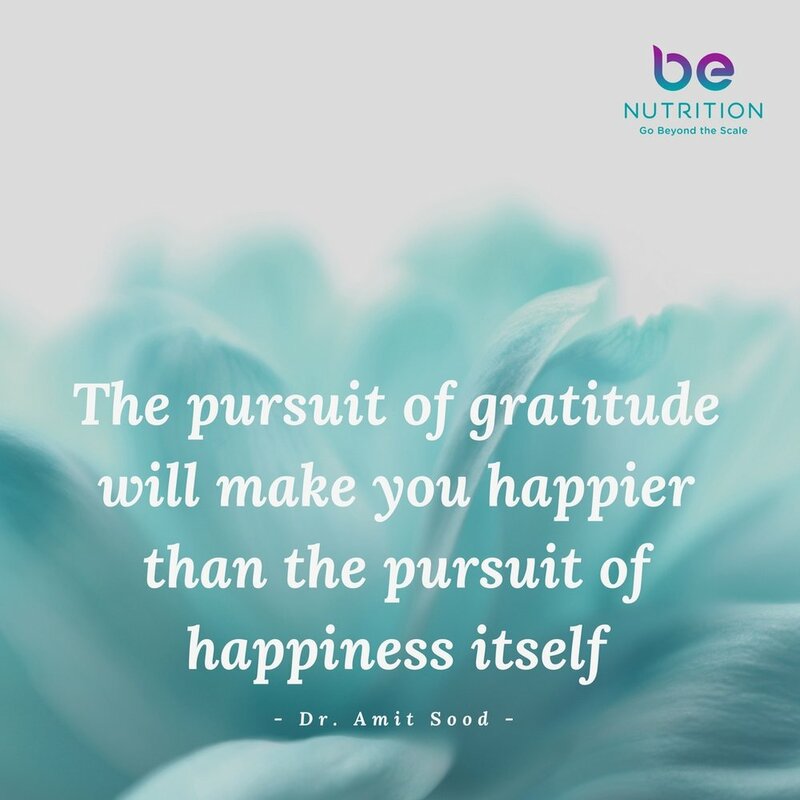 The more gratitude we have for our bodies, the better our ability to eat more intuitively and properly nourish our bodies – to eat when we’re physically hungry, and not when we’re sad, bored, anxious or experiencing an array of emotions. So, start Thanksgiving Day by thanking your body for the miraculous gift that it is. Open your eyes and breathe into your body, bringing attention to it with loving kindness. Express gratitude for the ability to wake up, breath, walk, talk, taste and smell. Shift your thinking away from thoughts about what you should or shouldn’t eat, and simply pause and give thanks for having food on the table, for the hands that prepared it and the opportunity to gather and share with friends and family. These are the beautiful things in life that we must not take for granted. Beyond Thanksgiving, simple ways to continue practicing gratitude include writing down at least three things that you are grateful for each day, and expressing gratitude towards others, by sending a simple note of thanks and appreciation. It’s so easy to get your daily dose of Vitamin G! Pleasure is essential to eating. It’s the vital component that makes our meals nutritionally complete. We are wired to seek pleasure and avoid pain. And how we feel about our meal and the attitude, or mental state at which we approach eating our meals, affects our digestion and nutrient absorption. When we eat too fast, or without awareness, or with guilt, the central nervous system and our gut register only a minimal amount of pleasure. As a result we are psychologically driven to eat more and continue to seek pleasure. Restriction and denying certain foods only leaves you wanting them more. So, let go of guilt, and labeling foods as bad or good. Instead of denying yourself certain foods this Thanksgiving, focus on the foods that you love; focus on your favorites and savor them. I mean really slow down and experience each and every bite. Experience the texture, engage your senses, focus on the sensations of taste – sweet, sour, salty, umami. Keep coming back to the taste of your food and be fully present with it. Be as present for the last bite, as fully as you were for the first bite. As you’re eating, ask yourself if you’re still enjoying your food. If not, then stop. Give yourself permission to stop, even if there is still food on your plate. After all, there will be plenty of leftovers tomorrow and the next day and probably the next. Vitamin G and Vitamin P are just as valuable to our health as protein, carbohydrates, fat, fiber, vitamins, minerals and water. So, I hope you’ll focus on these super nutrients of the heart this Thanksgiving. Give yourself full permission to thoroughly enjoy every bite. You deserve this time with family and friends! Let us give thanks and savor all the deliciousness that Thanksgiving brings! Now I’d love to hear from you: How do you get your daily dose of Vitamin G and what’s your experience with Vitamin P?